The sap moon has arrived! We have been the orchestrators of an Urban Maple Sugaring Project in our community for the past 6 years. Our project began with our own desire to learn about the process and add another wild food to our pantry. We now provide ourselves and our community with a locally produced sweet that is mineral rich. We tap trees throughout the city of Sheboygan, WI (population 50,000) with the permission of home and business owners. We share some of the harvest with the people who support the project. They of course enjoy the syrup and they learn that there is food right in their backyard! The project also includes collaboration with our local environmental center. The center evaporates our sap for us. The center has been tapping trees in their aging maple forest for many years. Their project is focused on providing a demonstration project for school groups and a community celebration of the harvest: Flap Jack Days. We help to tend the sugar shack and we give the center a percentage of the resulting syrup. After a long cold winter, we are thrilled to be able to participate in this community activity! A Couple of days ago, we and a host of other volunteers tapped the trees at the center. It was still a little cold for the sap to be running, but they are preparing for school groups and needed to have their demonstration project ready. It is ideal to tap trees just when the sap begins to run, as the resulting yield will be higher. The sap will begin to run when the daytime temperatures warm up above freezing. It has been a very cold winter here in Wisconsin and daytime temperatures have not yet reached above freezing. As we watch, weather predictions show that the temperatures will begin to rise next week. We are planning to tap trees for our project at that time. I like to tap the trees when the sap begins running, so that we can drink the first sap of the season right from the tap. It is a such a remarkable site to see the sap run from the tree, once you have placed the spile or maple spout. While today spiles are typically made out of aluminum, the stalks of many shrubby plants can be used today and have historically been used. Two of those shrubs are staghorn sumac (Rhus sp) and/or elderberry (Sambucus sp). We have used commercial taps, as well as made some of our own. As we begin collecting the sap, we will transform much of the beautiful mineral rich sap into syrup for use throughout the year. The sap to syrup ratio is typically 40:1, but does fluctuate depending on many factors. To learn more about maple sugaring view our video on maple sugaring at this link. In addition to transforming the sap into syrup, we also use the sap, which looks like water, but has a very slight sweet taste in other preparations. We also simply drink it. We like to use the sap as a base for teas and infusions. The sap adds minerals and a slight sweet taste to any beverage! We have partially reduced the sap and made maple soda as well as maple wine. These are some of the most delicious and do not last long in our house! We also use the water as a base for cooking venison stew. The sugars in the sap, tenderize the meat. The stew meat melts in your mouth. Of course you can use any meat that you have access to and your own stew recipe, just be sure to cook it slow for a long period of time. I like to use the slow cooker or crock pot for this. Cooking beans in sap, is something I learned from my dear friend Rose Barlow. 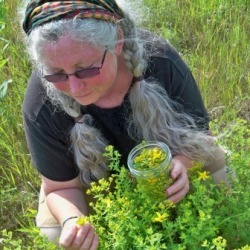 Rose was an herbalist who was one of the inspirations for our sugaring project. She used to tap a couple of trees in her yard each year and she would make delicious maple beans. While Rose died a couple of years ago, she is always present in my kitchen when I put the beans and syrup together in the pot. Below is my version of her wonderful Maple Bean Recipe. Happy Sap Moon to all of you. May the change of the season be sweet and kind. These baked beans are slow-cooked in a crockpot for about 24 hours. As the sap slowly cooks down it turns into a sweet, maple-flavored gravy. 1. Soak beans in water overnight in water and a TBS of whey or miso as well as piece of seaweed. If you do not have whey, miso or seawwed, you can simply add salt. 4. Add diced onions and a little more maple sap if they seem a bit dry or low on liquid at this point. 5. Continue to cook with the lid off of the crockpot overnight. These freeze nicely for use throughout the year. They are delicious served at barbeques and/or potlucks!